One of the most common fungal diseases of pines in Nebraska is Dothistroma needle blight. 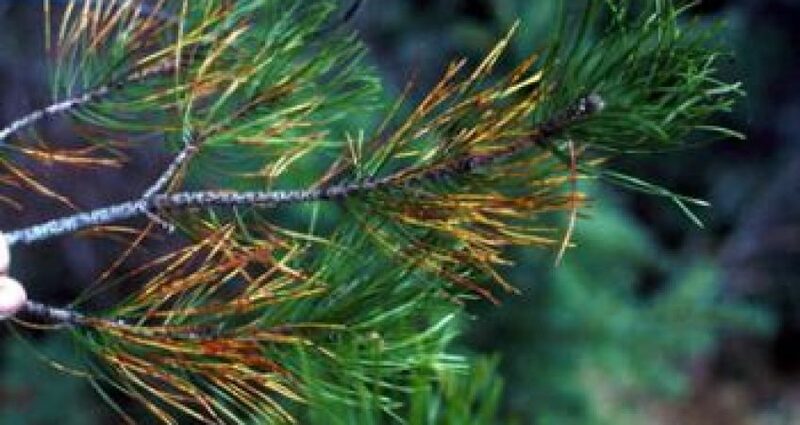 This disease is responsible for much of the premature needle drop that occurs in windbreaks and ornamental pine plantings. Twenty pine species are affected by this disease, but in the central and eastern United States the fungus is found most commonly and causes the greatest amount of damage on Austrian and Ponderosa pine. Scotch pine is usually not severely damaged. Symptoms of infection begin in the fall. Yellow or tan spots appear on needles of the current year’s or older growth. These spots darken and become brown or reddish-brown then spread to form a band around the needle. These bands are often bordered by a yellow, chlorotic ring on each side. The fungus grows within these tissues, killing that portion of the needle beyond the lesion. Initially, the tip of the needle dies while the base remains green, but eventually as the disease progresses, the base of the needle also dies, and the entire needle drops off the tree. Typically, clusters of needles within a shoot are infected. Lower branches of trees are most severely infected although the entire tree can be affected. Usually the greatest amount of needle drop is seen in the late spring or early summer following infection. Initial infection of the tree by fungal spores occurs during rainy periods from May to October. Germinating spores enter the needles through natural openings and the infection process begins. Symptoms appear about three to four months after the first infection, usually becoming visible in late fall. Infection of susceptible needles can be significantly reduced with liquid (Tenn-Cop 5E or Black Leaf Liquid Copper Fungicide) or fixed copper formulations (Basic copper sulfate or Tribasic Copper Sulfate) or with Bordeaux mixture applied twice during the growing season. Read and follow all label directions carefully before application. The first application should be done in mid May, and protects the existing needles from infection. The second application, which protects the current season’s new growth, is made after considerable new growth has taken place, usually around mid June. This spring’s new growth is initially resistant to infection and will not become susceptible until midsummer, around July. Effective control can be achieved in some cases with only a single application of fungicide made in early June. However, there is considerable risk with this procedure since infection could occur in the older needles before the early June application is made. Annual applications of fungicide are not always necessary to control this disease. Monitor susceptible pines for symptoms of infection each year. If infection occurs during a year in which fungicide has not been applied, and is severe enough to warrant control, then fungicide can be applied the next year with confidence that good control will be obtained. If little or no infection occurs during a year when fungicide was not applied, then spraying can be skipped for another year.